Pre-drawn security and access plan symbols represent card access, biometric access, keypad device, etc. These symbols help create accurate diagrams and documentation. 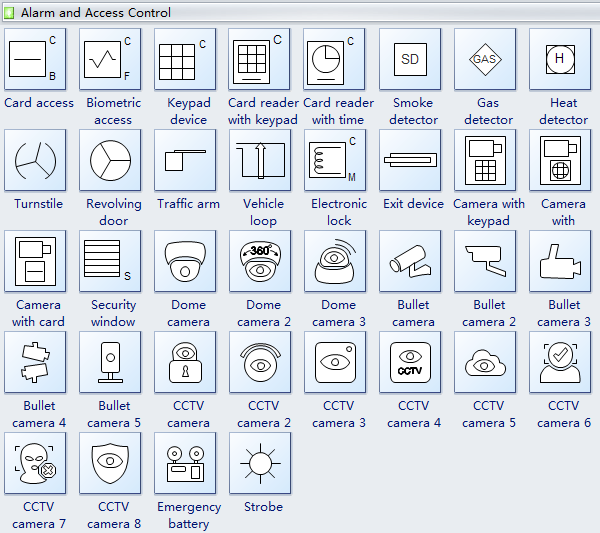 Edraw security and access plan software offers you plenty of special shapes used in the security and access plan like card access, biometric access, keypad device, card reader, smoke detector, gas dector, heat dector, turnstile, revolving door, traffic arm, vehicle loop, electronic lock, etc. Alarm and access control symbols like card access, biometric access, keypad device, smoke detector, gas detector, heat detector, revolving door, traffic arm, CCTV camera, emergency battery, strobe and more available here. Card access is smart card that enables physical access to buildings and controlled spaces. Smoke detector is fire-protection device that automatically detects and gives a warning of the presence of smoke. Gas detector is a device that detects the presence of gases in an area, often as part of a safety system. Heat detector is a fire alarm device designed to respond when the convected thermal energy of a fire increases the temperature of a heat sensitive element. Turnstile is a mechanical gate consisting of revolving horizontal arms fixed to a vertical post, allowing only one person at a time to pass through. Revolving door is an entrance to a large building in which four partitions turn about a central axis. Vehicle loop can detect vehicles passing or arriving at a certain point. Dome camera is for security surveillance and it does not record red light violations. Bullet camera is a type of video camera often used in surveillance systems, named because of its shape and size. CCTV camera is short for closed-circuit television (CCTV) cameras and it can produce images or recordings for surveillance purposes, and can be either video cameras, or digital stills cameras. Strobe is an electronic flash for a camera. Dragging the handle to change the direction of bullet camera is quite convenient. Video surveillance symbols like camera, motion detector, screening device, monitor, push button, recorder, switch manual, video motion, wire connector and more are available here. Motion detector is a device that detects moving objects, particularly people. Glass break sensor is used in electronic burglar alarms that detects if a pane of glass is shattered or broken. Screening device is a portable measuring instrument that a police officer can use to gather evidence related to blood alcohol content. Monitor is a device used for observing, checking, or keeping a continuous record of something. Recorder is an apparatus for recording sound, pictures, or data. Wire connector is fastener used to make a tight connection between two or more electrical wires. Initiation and annunciation shapes like multiplex panel, control panel, CPU, keyboard, printer, intercom, two way radio, document destroyer are available here. CPU is the abbreviation for central processing unit. Keyboard is a panel of keys that operate a computer or typewriter. Need fresh looking security and access plan symbols for your design? These security and access plan symbols are a cinch to pop in. And their crisp, fine detail will make spectacular, easy-to-understand diagrams and presentations to your customers.